Do you have some plain towels calling out for a bit of interest? 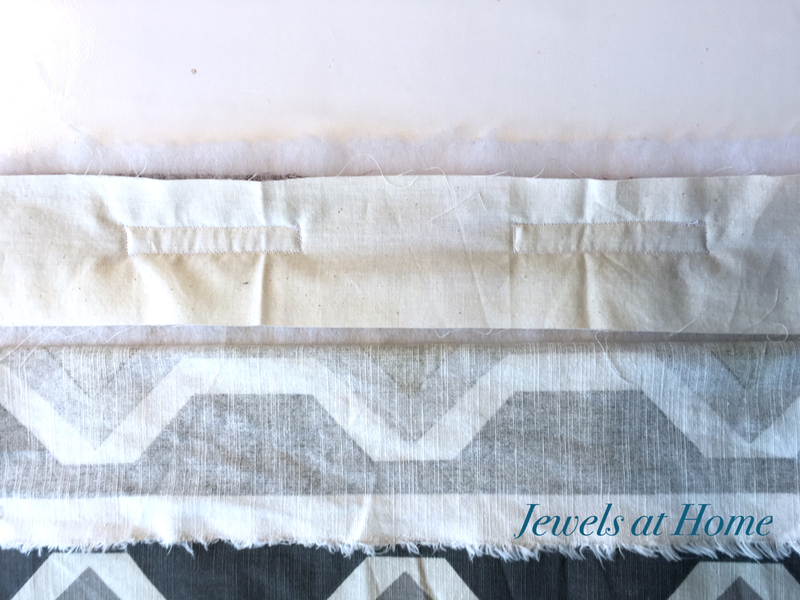 Adding some ribbon or a beautiful fabric – or both – to some towels is an easy way to transform them. 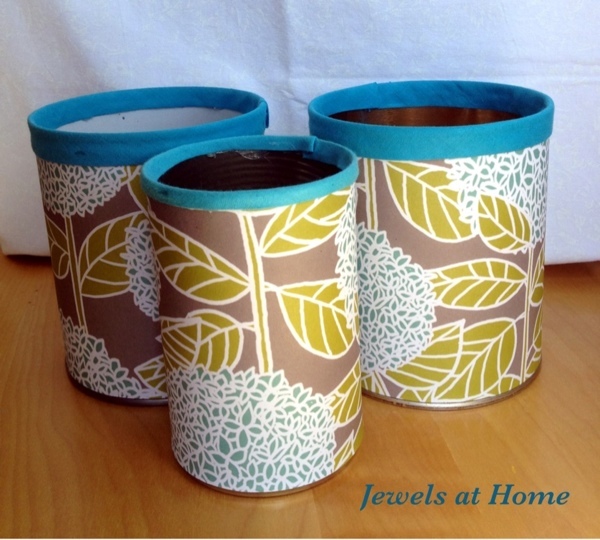 The finished products make great accents for your home and would be great housewarming gifts! 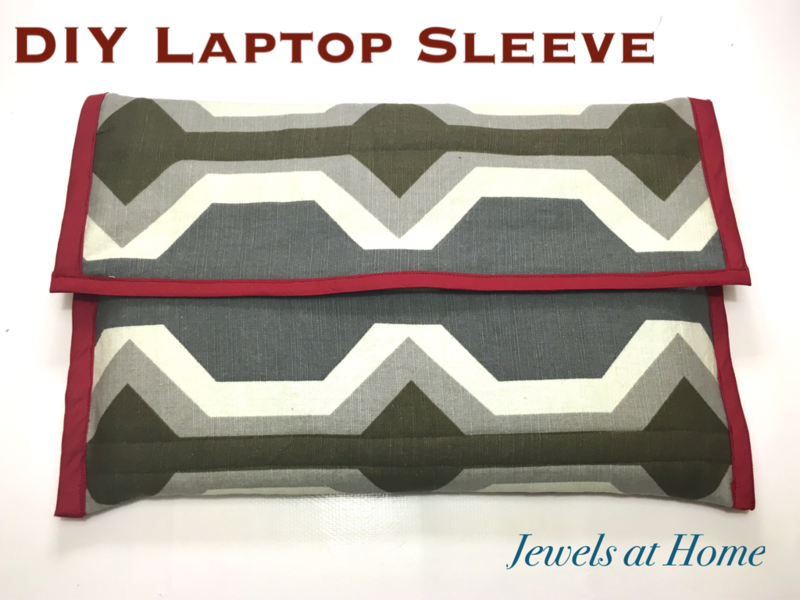 The sewing is all straight lines, so a forgiving and doable project. These plush towels were lovely already, but I felt like dressing them up a bit. I used a band of fabric and some bias tape. Before you start this project, prewash the towels and fabric, so they won’t pucker later, if they shrink unevenly. I started by cutting strips of each fabric to the width I wanted and joined pieces end to end to make a long strip. 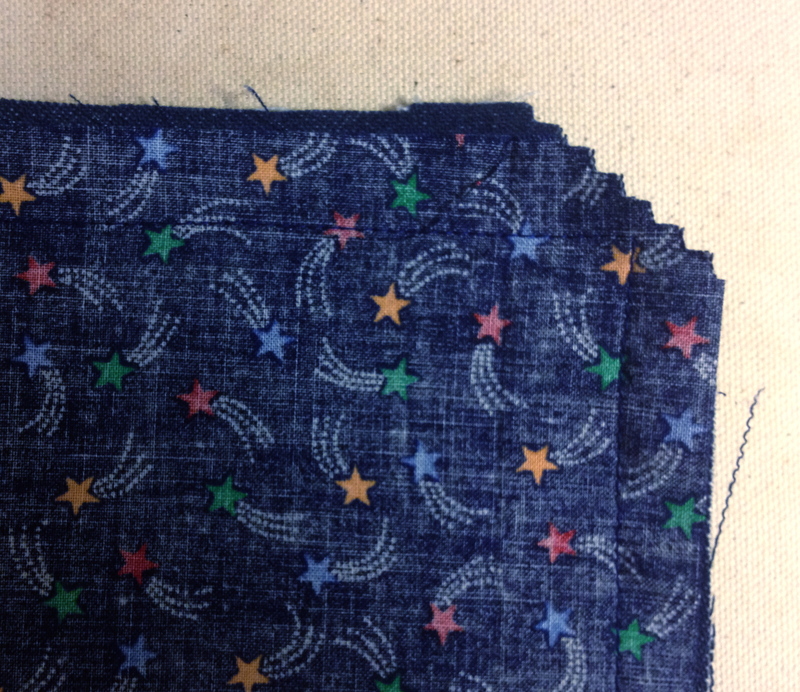 Then, I joined the strips of different fabric to each other and ironed down a seam allowance on the top and bottom. Finally, I cut sections a bit wider than each towel and pinned it onto the towels, folding a seam allowance on the ends before sewing the fabric to the towel. 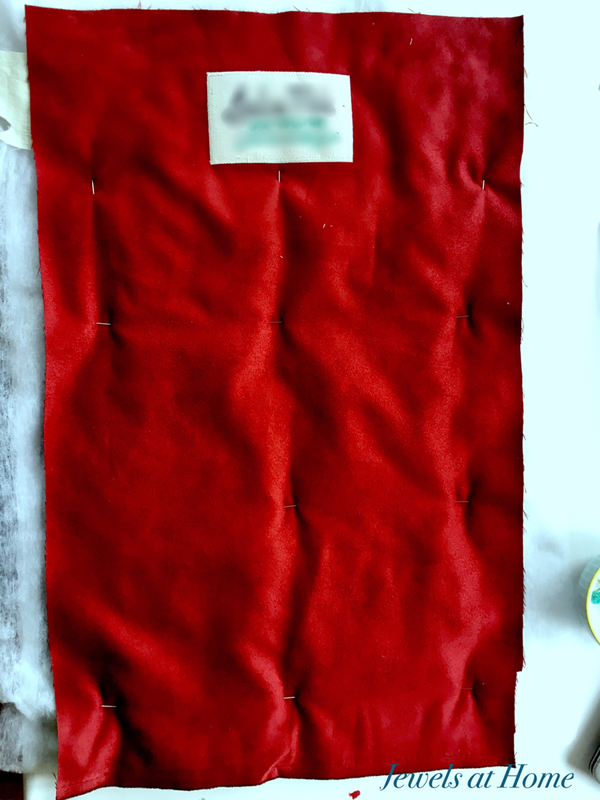 Pin the fabric in place, turning under the raw edges. This was really an easy project, and I think it makes a big impact! I used a little bit of the green and white fabric to decorate a basket in the vanity, to tie the room together. Finished towels with new fabric border in our master bathroom. 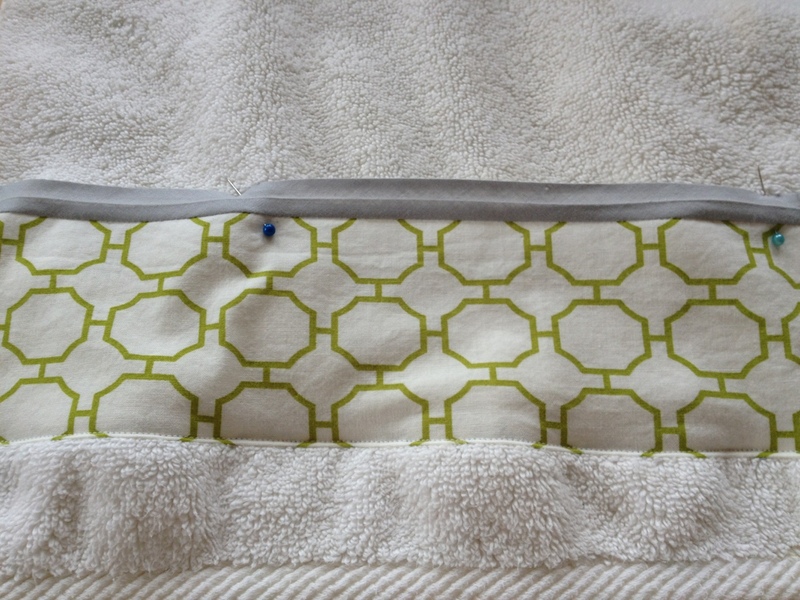 New fabric border on master bath towels. 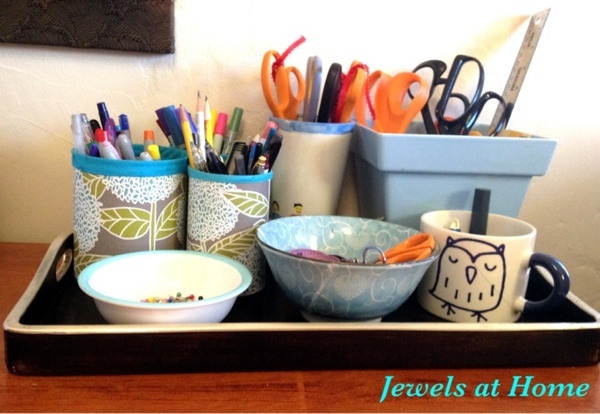 A funny story along the way: ever wonder what the kids think of all these craft projects? Our six year-old saw the fabric pinned to the towels in my sewing room and asked, “But won’t the pins hurt?” It reminds me that all my great ideas might seem a little crazy to others. 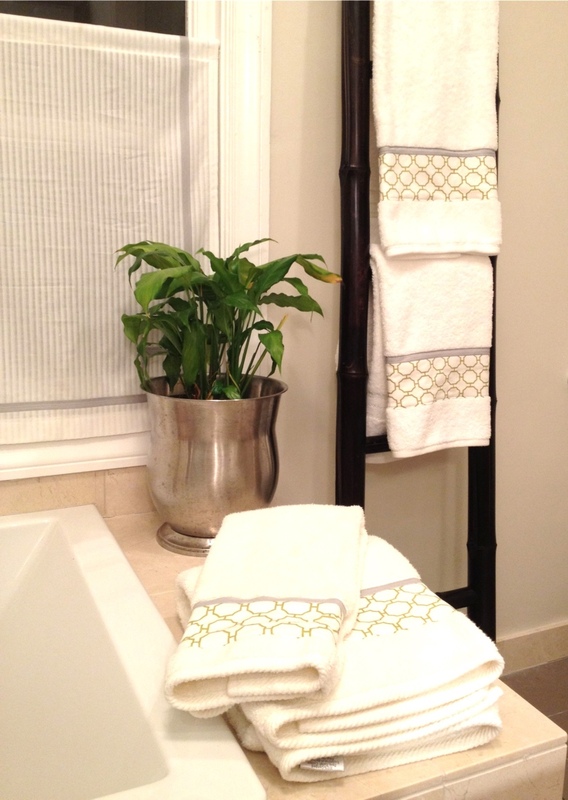 Now that I’ve decorated these towels for our master bathroom, I’d love to try some more. I’ve seen some very pretty versions of this idea on tea towels or burp cloths, all of which would make great and special handmade gifts. 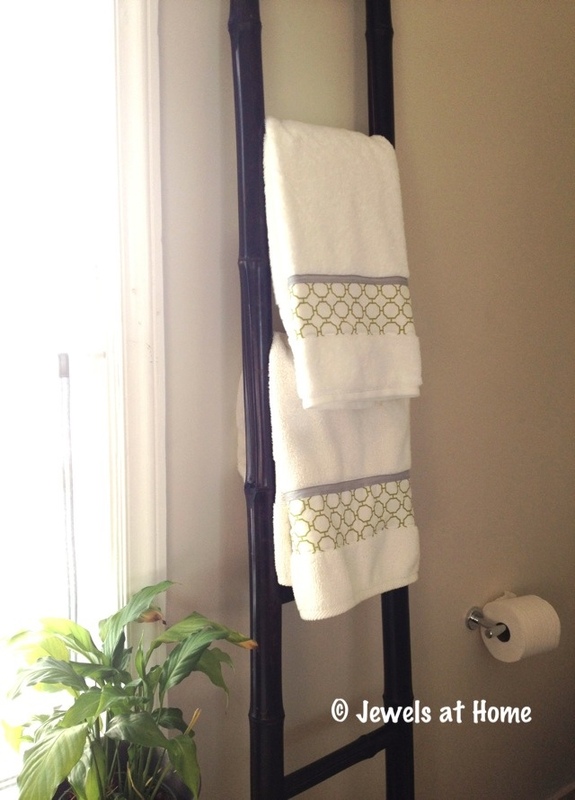 And with these towels, our master bathroom is pretty much done, do that room tour will be coming up soon! 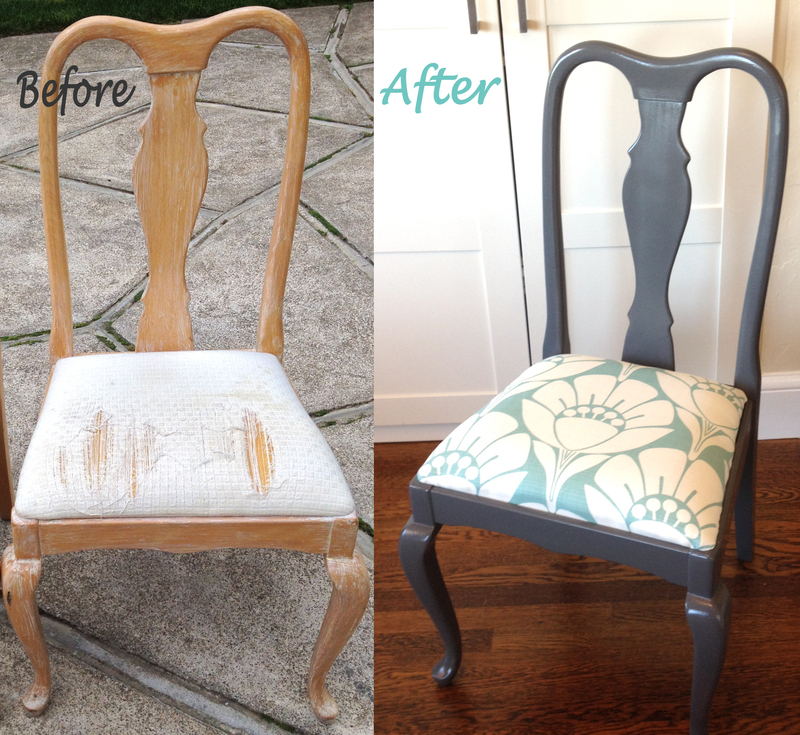 Re-inventing an old chair is one of the easiest furniture makeovers, and it is so rewarding to create a one-of-a-kind gem like this! 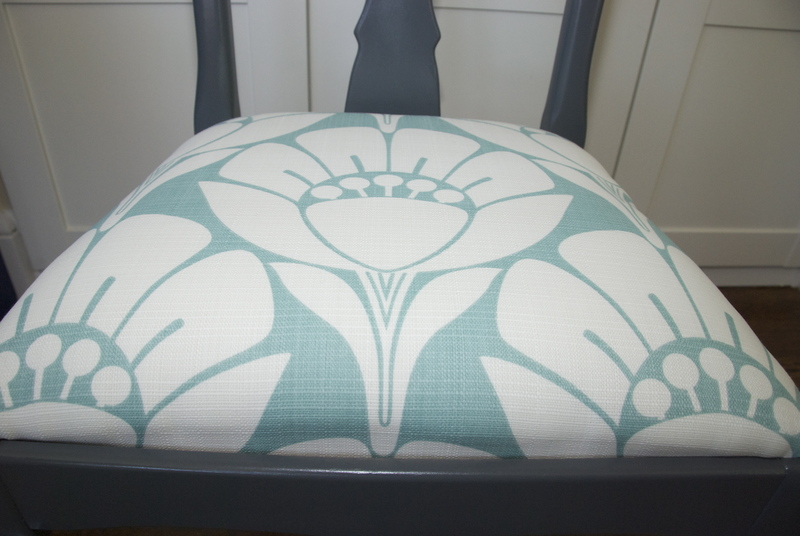 When I debuted my Queen Anne chair makeover, I provided some tips for painting. 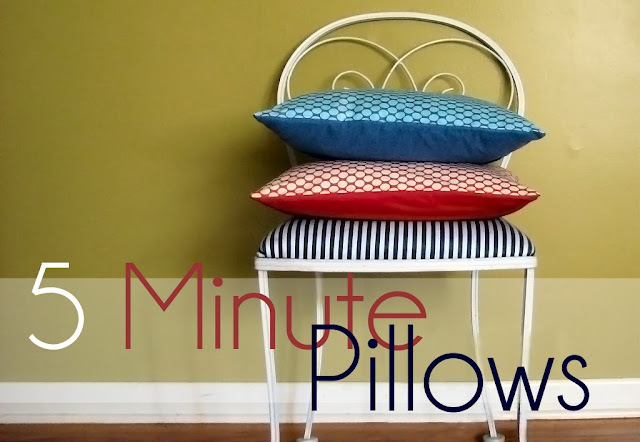 Today, I’ll cover the basics of reupholstering a chair seat. I had also mentioned in the earlier post that I had discovered a great fabric choice for seats, so let’s start there. 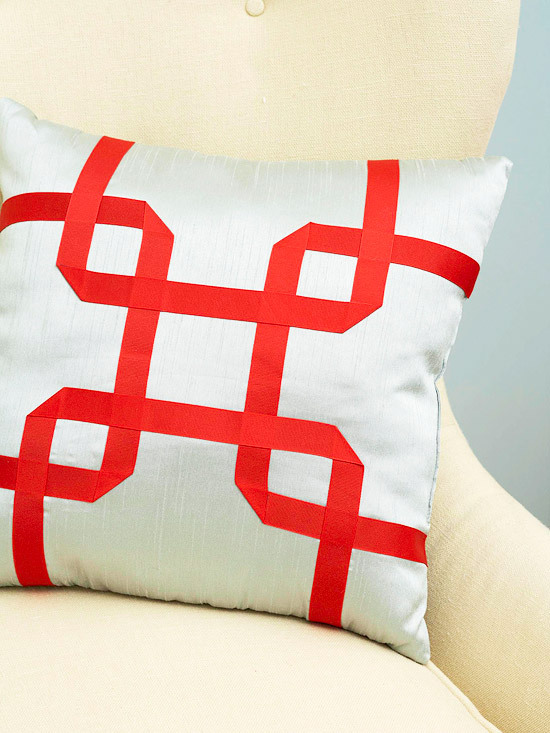 The secret is that this beautiful fabric, with its bold graphic pattern and textured weave, is not a standard decorator upholstery fabric but an outdoor fabric! It won’t stain, fade, or wear out. You can wipe or even scrub it clean! 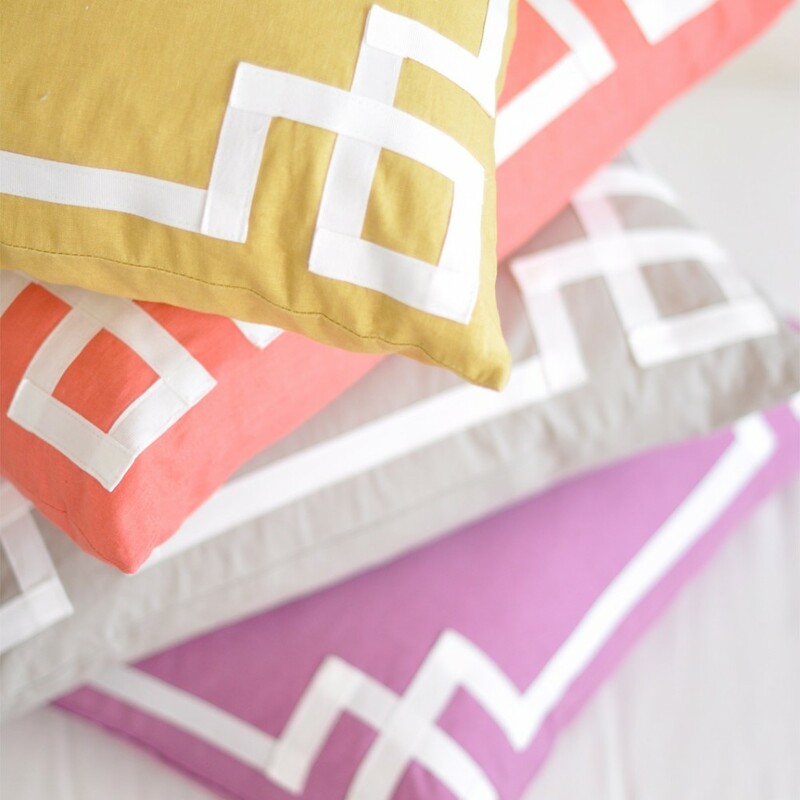 These days, the options for colors, patterns, and textures in outdoor fabrics are immense. 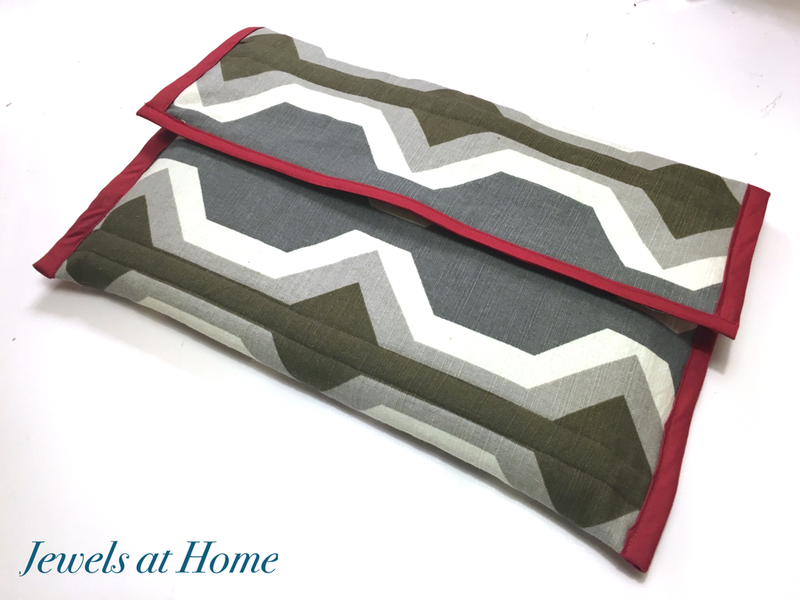 I’ve used outdoor fabrics on several projects, and the results have been great! “Muse” by P. Kaufmann in Aqua. 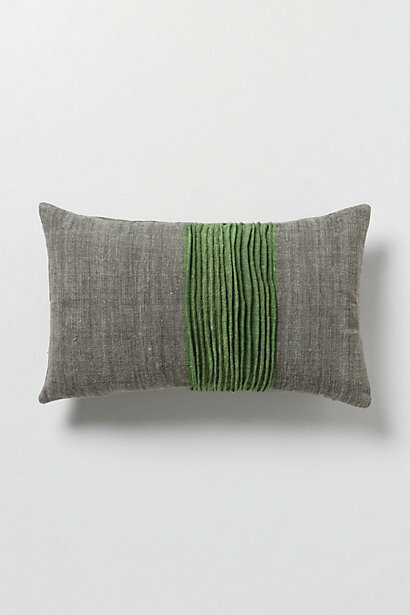 A colorful outdoor polyester fabric with a linen texture. “Lake Paradise” by Robert Allen in Spa. 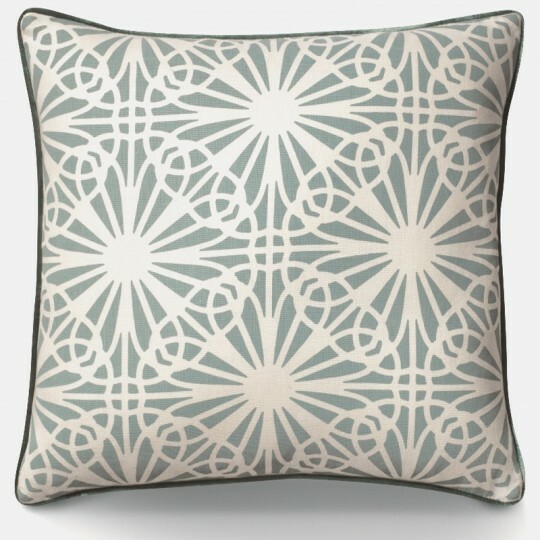 Another outdoor polyester with a whimsical print. These are our dining room chairs. More about them soon! “Dupione” by Sunbrella in Sand. This acrylic weave indoor/outdoor fabric was on a built-in bench in our old house and was clearly toddler- and sippy cup- friendly. I’d love to recreate that bench in our current home. 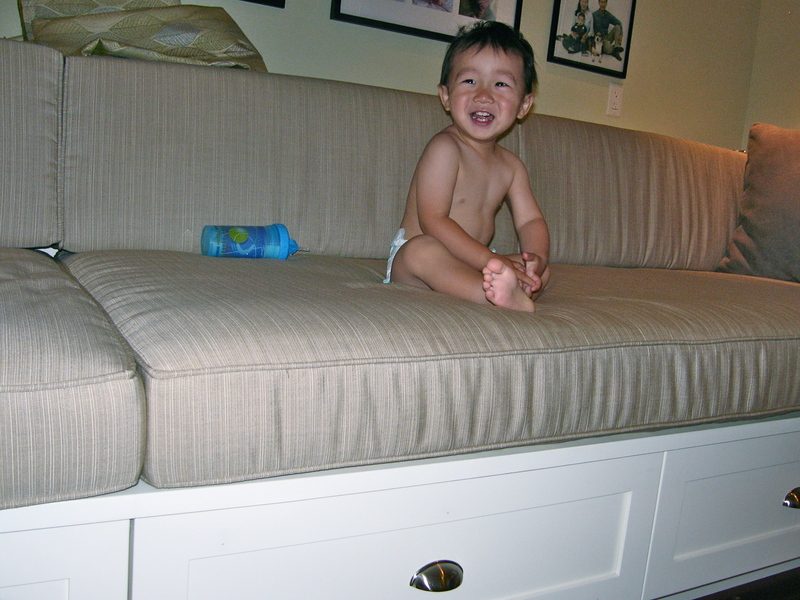 It was great for lounging and had lots of storage in those drawers underneath. I bought the Lake Paradise and Muse fabrics from fabricguru.com. This is definitely my favorite source for online fabric shopping. They have good prices and selection, and they make it easy to search, which can be overwhelming with some of the other sites. I bought the Sunbrella Dupione from a marine supply store online. A couple of caveats: the polyester outdoor fabrics are stiffer than cotton upholstery fabric, so they don’t feel as soft or wrap as neatly around corners as a cotton. 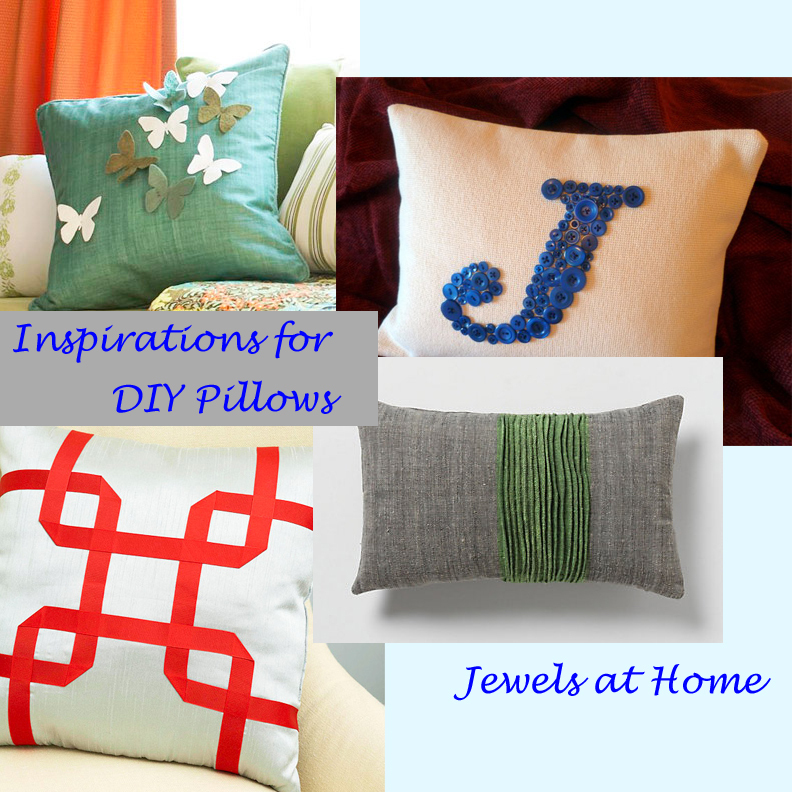 Also, while fine for the upholstery, they would feel stiff on a cushion, so if you want to create coordinating pillows or other items, you might want to look for the same print in a regular decorator cotton. 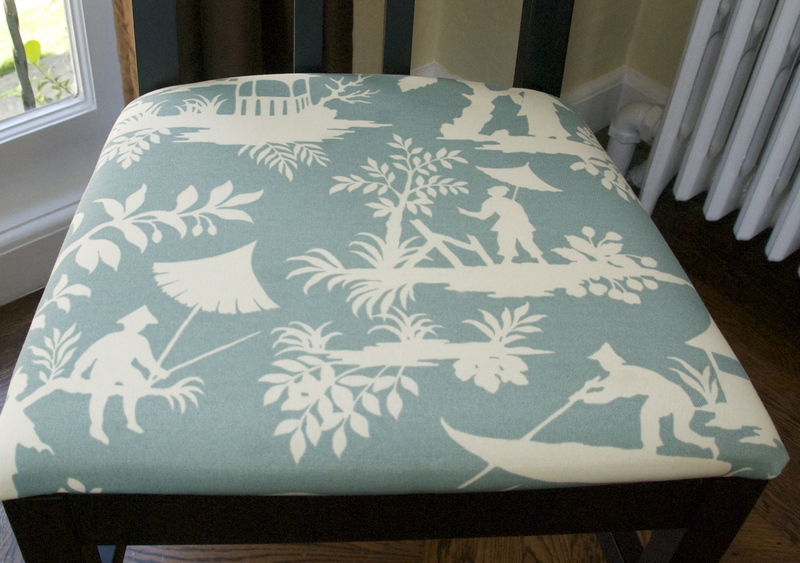 I found the acrylic was much softer to the touch, though I did not do the sewing on those fabulous bench cushions. I also have noticed some slight piling on our dining chairs, but it’s very minor, and I am sure that they would be in much worse shape by now, if I had used a standard cotton fabric, because we eat there every day. 1. Use a flat head screwdriver and pliers to remove all the old staples. Argh! Look at all those staples. This took a long time! 2. 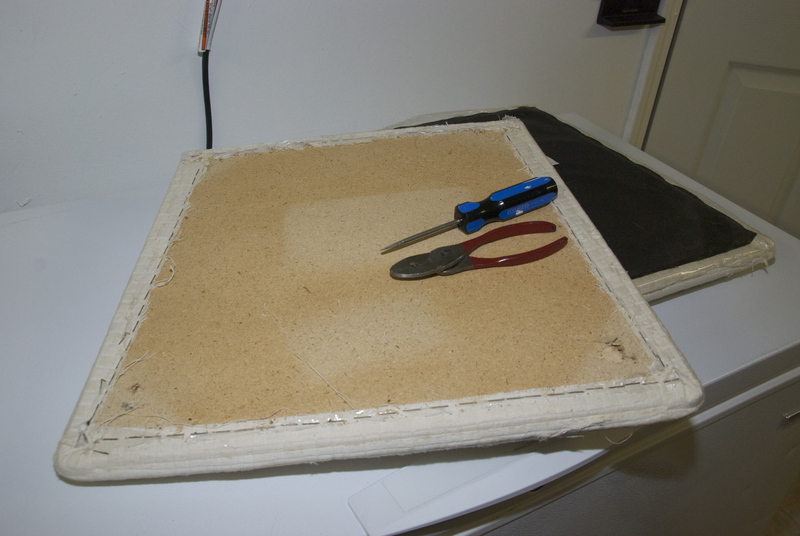 If you aren’t reusing the old foam, cut a new cushion from a sheet of foam from the craft store. 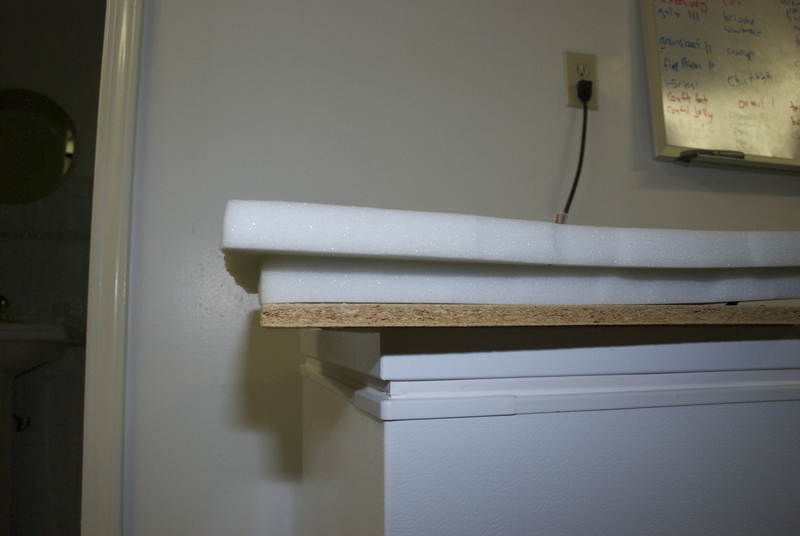 I used two pieces of 1/2″ foam, one cut to fit the seat exactly and the other a bit wider, to wrap around the outside of the seat. 3. Center the fabric under the foam and seat bottom. For a large print, like the “Muse” on my Queen Anne chairs, pin the fabric in place, to make sure the pattern is centered. 6. 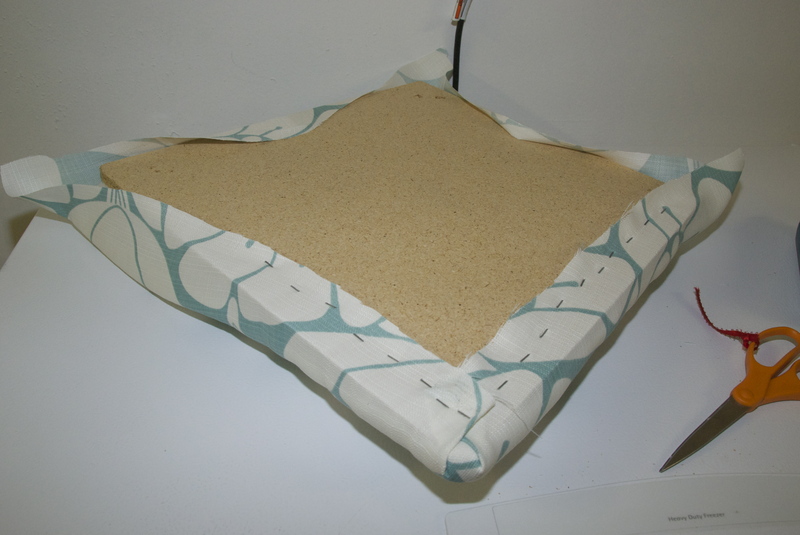 Now finish stapling the fabric on the sides. Depending on the angle, sometimes you need an extra fold in the fabric. 7. Repeat for all sides and corners, and you’re done! 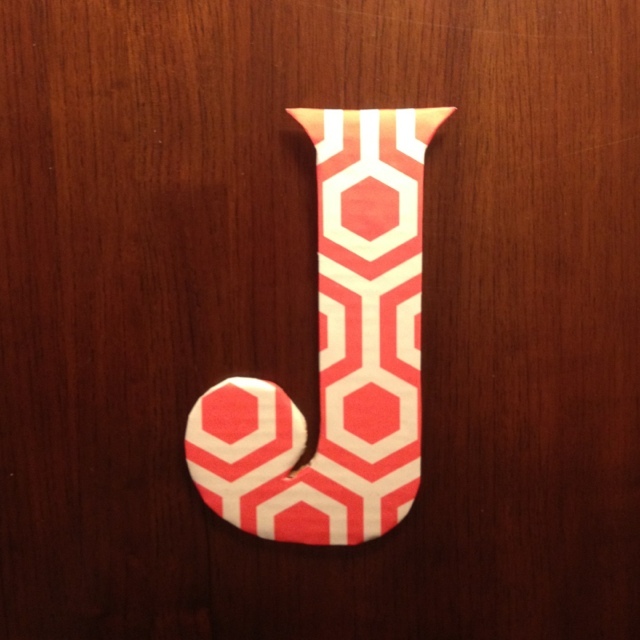 In a recent post, I brainstormed ways to help my friend preserve the record of her children’s heights marked on a door jamb in their house. I loved looking at all the great ideas out there, as well as coming up with some of my own. 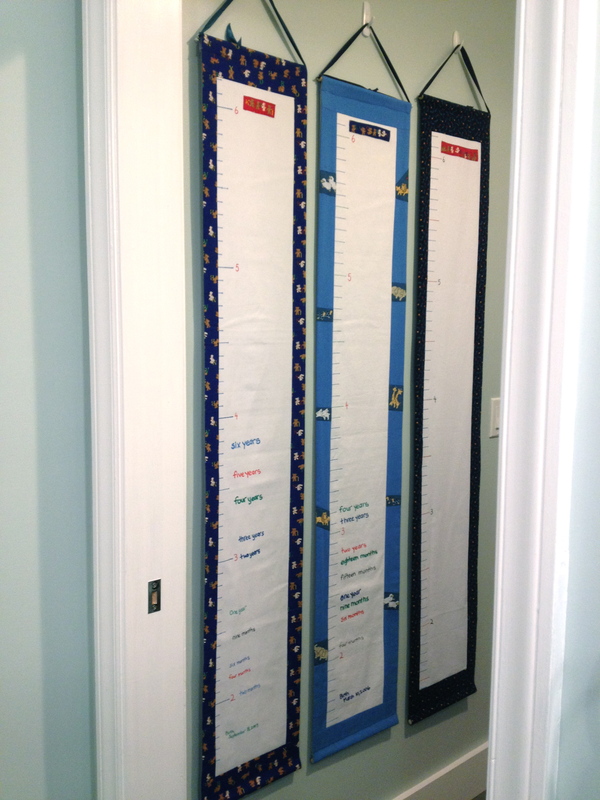 At the end of that post, I included a picture of the hanging fabric growth charts I made for my kids. 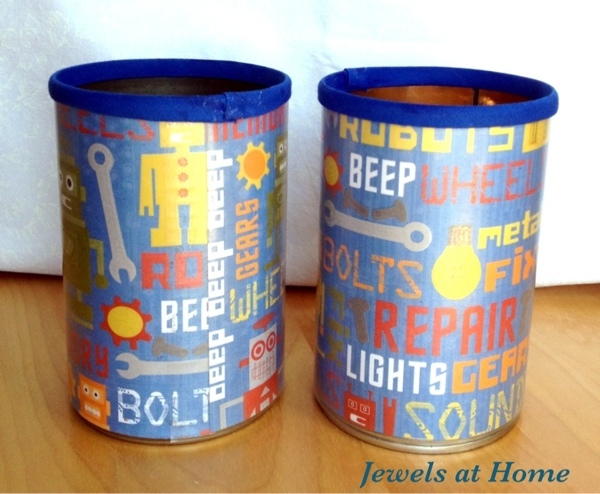 In case you want to make one for your family or as a gift (I first designed this as a baby shower gift! ), I’ve broken down the steps here. Let me know if you have any questions! 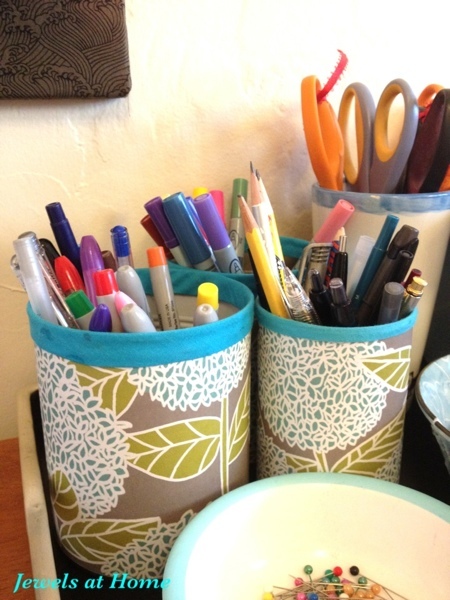 easy to store – fabric can be rolled up for compact storage and ironed later – wood, obviously, cannot, and paper could get folds and wrinkles – though you could wrap around a paper towel roll to minimize this. complete – I wanted to be able to record my kids’ growth from birth to adulthood. Many ready-made growth charts stop around five feet. Granted, most tweens and teens may not have any interest in growth charts anymore, but their parents might, so I made mine go up about 6’2″, just in case! The finished size of this growth chart is approximately 11.5″ wide x 54.5″ high. 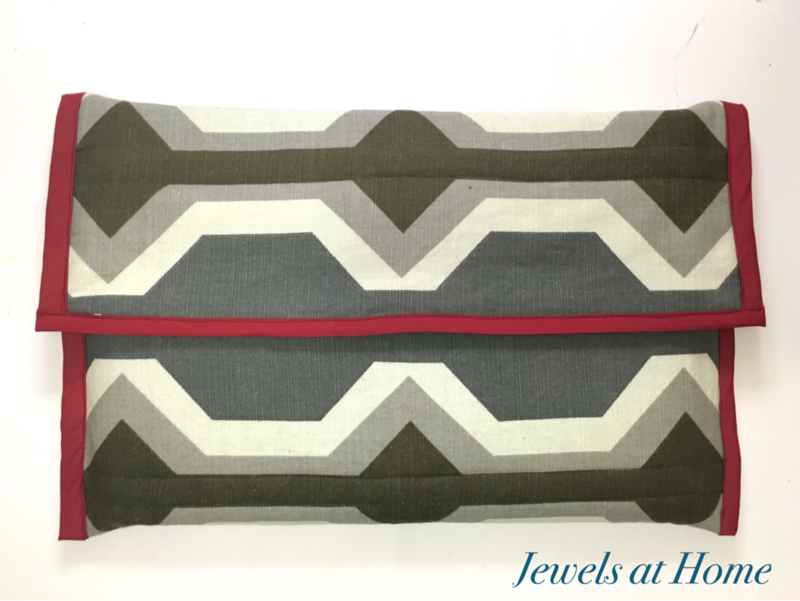 border fabric (equivalent to 1/2 yard of 42″ wide calico): I won’t be bossy here – use whatever you like! 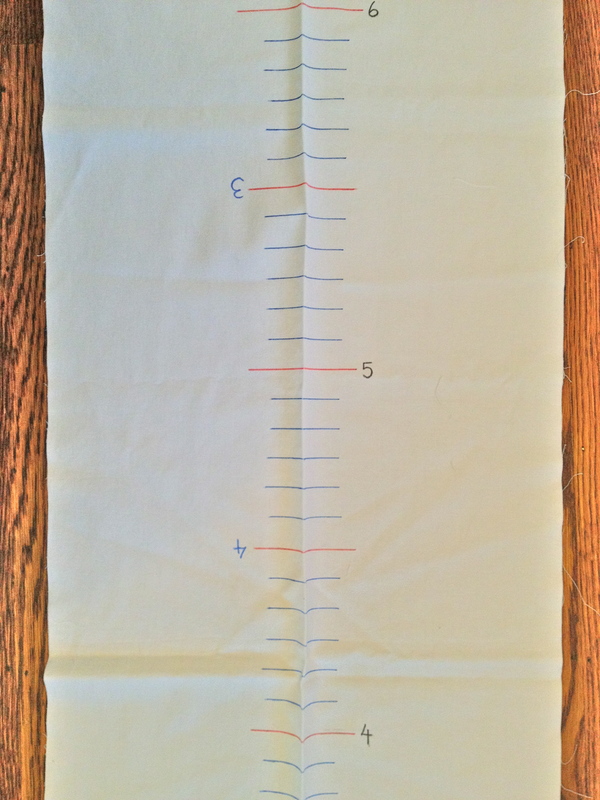 1) On a strip of white fabric that is 8.5″ wide for each growth chart, mark out inches from 1’6″ to 6’2″ (or whatever you like) by laying a tape measure on the fabric and using a ruler to draw lines with a fabric marker or Sharpie. I used a different color and longer marking every six inches. The short lines are 1.5″ and the long lines are 2″. 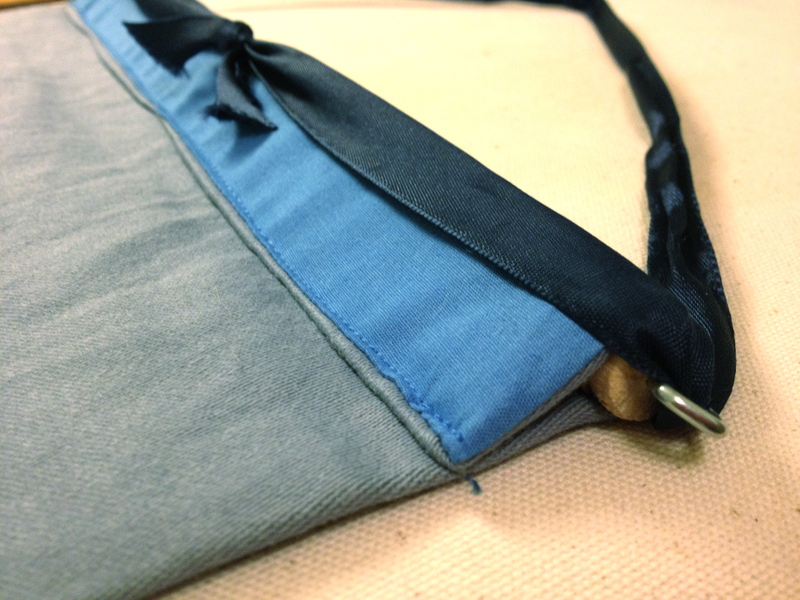 Remember that lines on the finished product will be shorter, because a 1/2″ will be in the seam allowance. If you are making more than one growth chart, you can be efficient and mark lines for two at a time, as shown below. You will need a slightly longer fabric strip and want to number from both ends, so the marks are on the left of each chart. Inches marked on white fabric using fabric markers. 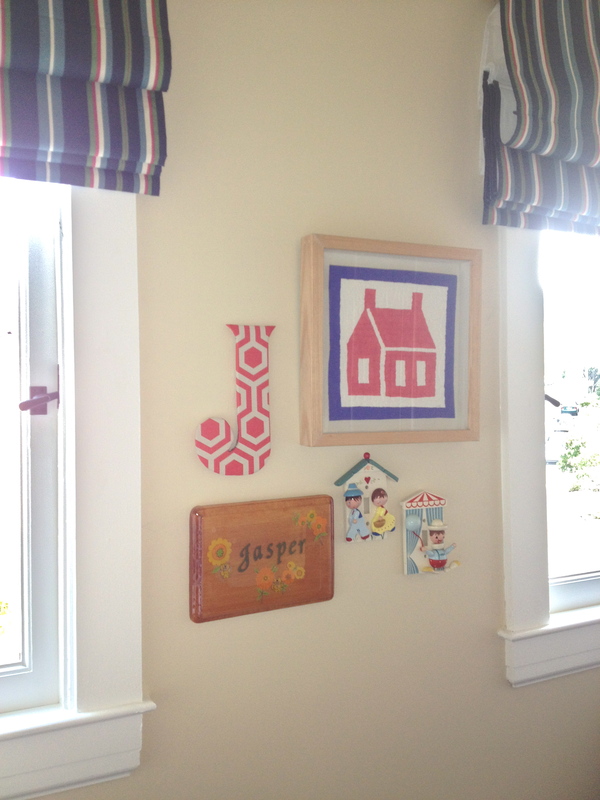 2) Cut out strips for a border. 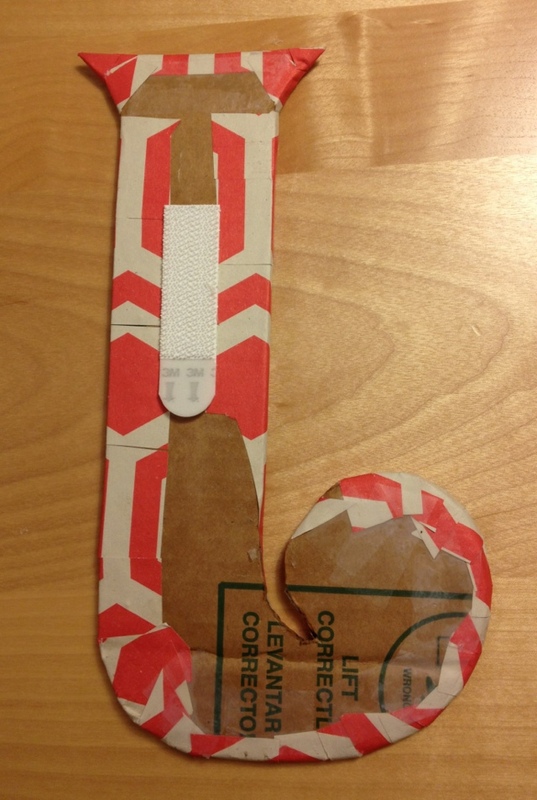 The side strips are 2.5″ wide. 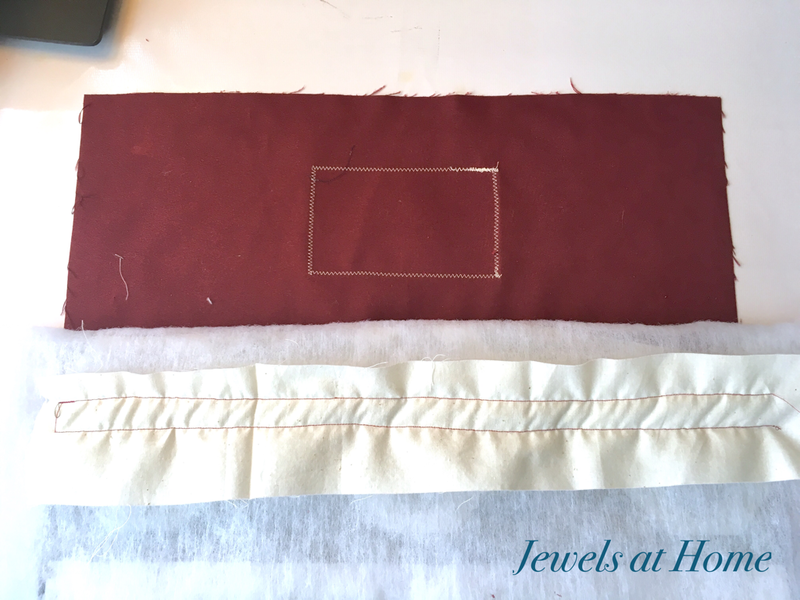 The chart should be 58″ long, but cut your strips about an inch longer, in case you are like me, and straight lines magically transform into uneven ones… For preparing the border, I used a rotary cutter with quilting ruler and mat. These tools are designed for quilting, where you have to piece together very precise lines and angles, but they work well for lots of other projects. 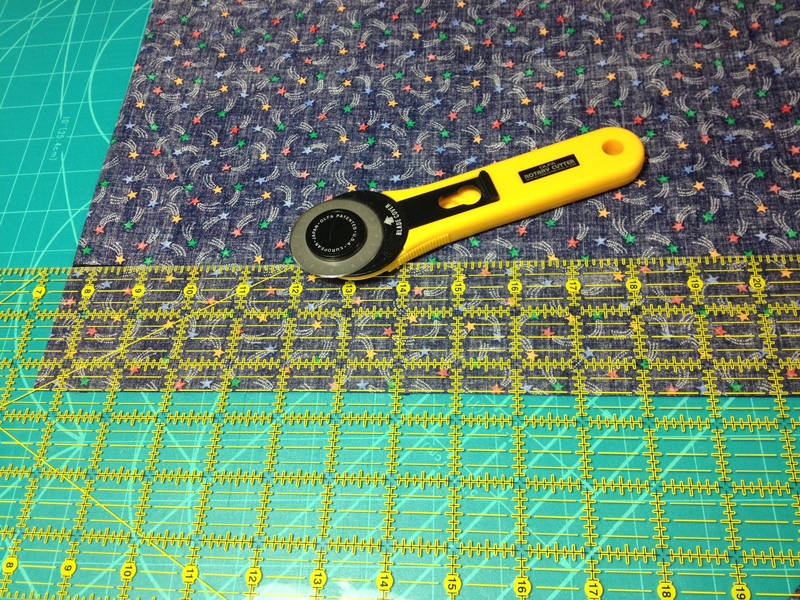 Quilting tools: rotary cutter, quilting ruler, and mat. These are so useful for getting straight lines and square angles on all sorts of projects. I even use the mat and ruler for cutting paper. 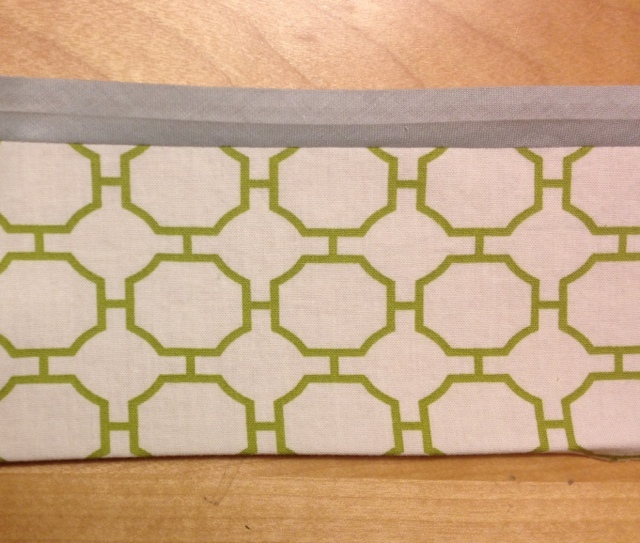 3) Sew the side strips onto the white center, using a half inch seam allowance. Iron flat, with the seam toward the border. Trim the border pieces so they are flush with the white section. Again, the quilting tools are great for getting things straight and square. 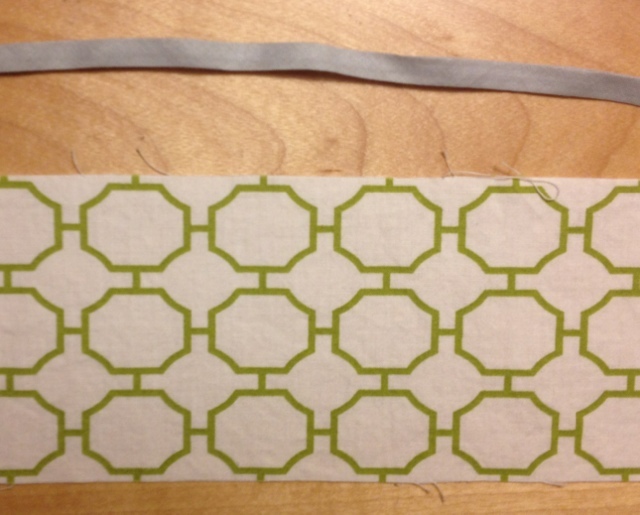 4) Next, cut strips for the top and bottom border. These are 5.75″tall, and they should be 11.5″ wide. Again, I cut the pieces a bit wider, to compensate for the nasty elves in the sewing machine. 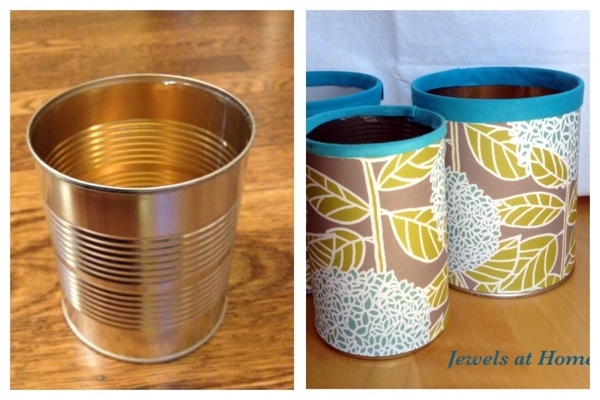 Sew these on to the top and bottom, using a half inch seam allowance. Iron with the seam toward the border. Now that the front is complete, trim where necessary to make sure it’s even (square at the corners, same height on both sides, same width at top and bottom). After trimming the center piece, join the top and bottom borders. You could add any decorations you want to the front at this point. 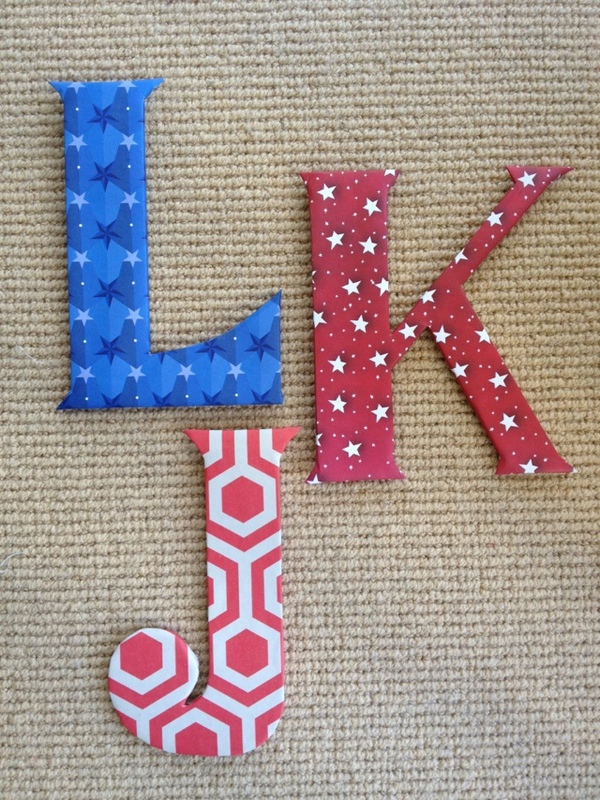 I put each child’s name at the top, piecing together letters from a fun teddy bear alphabet print. I also added a “Made with love by ‘Jewels'” tag to the bottom. 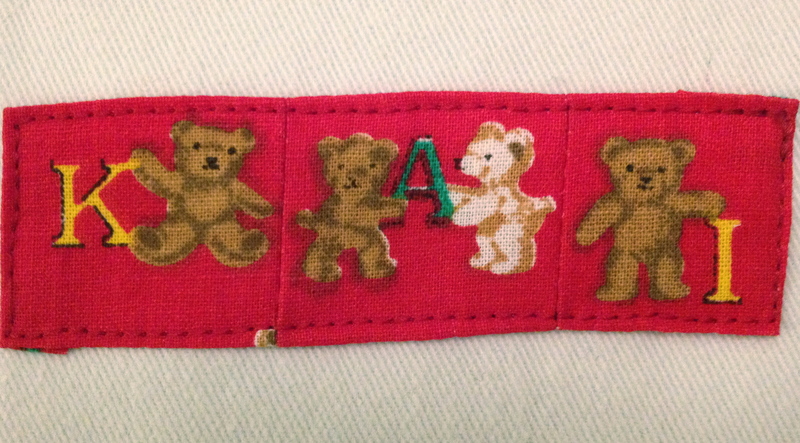 I put each child’s name on his growth chart using letters from this cute teddy bear print. 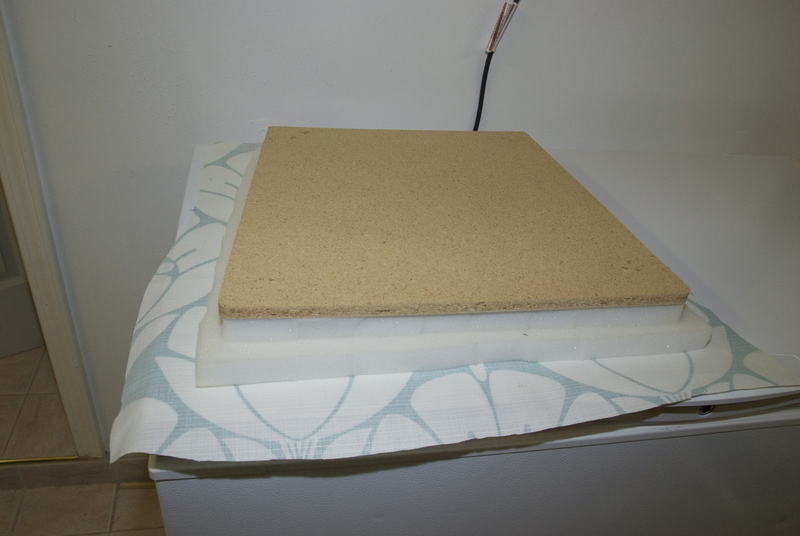 5) Cut a piece of backing that is the full size of the front (should be about 11.5″ wide and 69″ long, but measure your actual piece). 6) With RIGHT sides together, pin, then sew the front and back pieces together, using a half inch seam allowance, leaving one of the short ends open, so you can turn the piece. 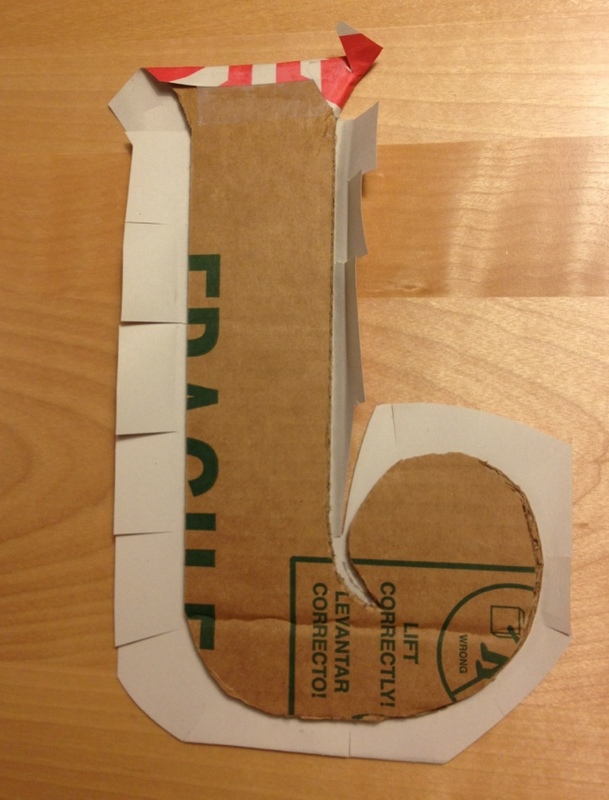 7) Cut diagonal triangles from the corners, so they turn neatly. 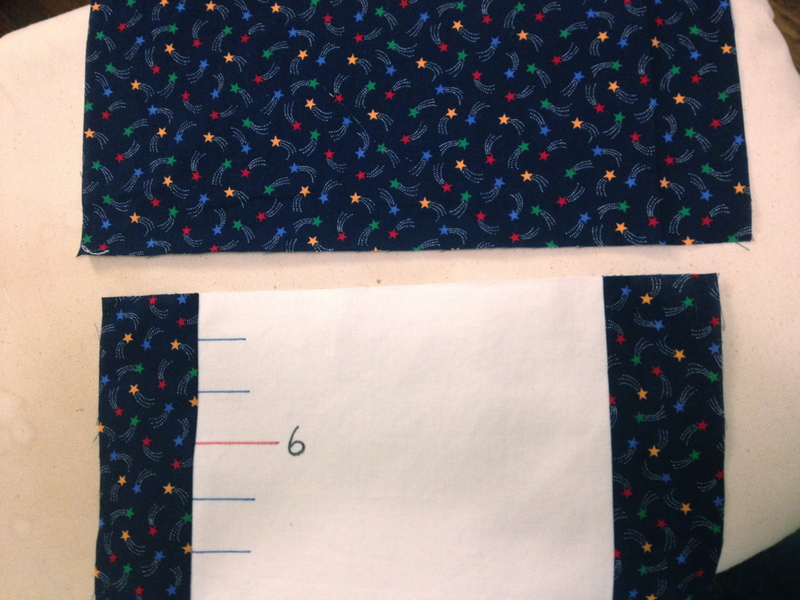 Then, turn the growth chart right side out and tuck a half inch seam allowance under on the open end. Iron the whole piece flat. Cutting across the diagonal at the corner will give a neater finished appearance. 8) Cut two pieces of doweling that are the same length or a tiny bit shorter than the finished width of your growth chart. Attach the screw eyes to both ends of one piece. 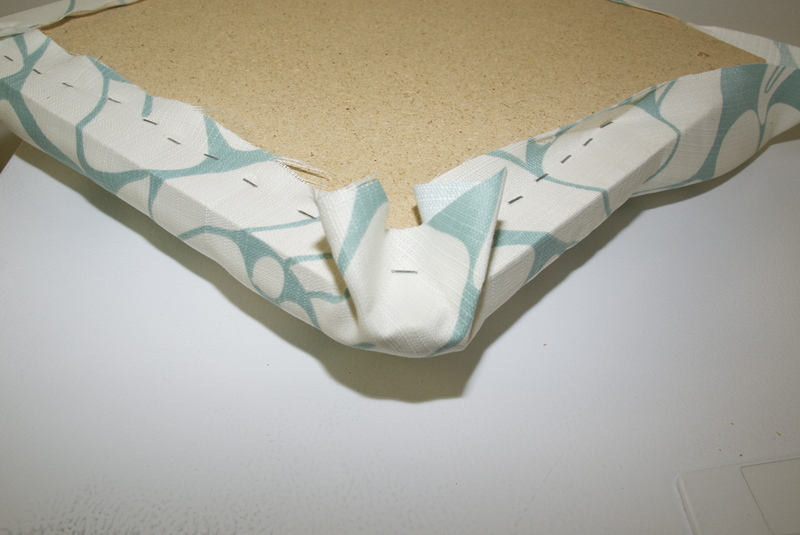 9) Fold towards the back and sew down a 1.25″ flap on the top and bottom to create a pocket for the dowels. This will also close the end you left open. 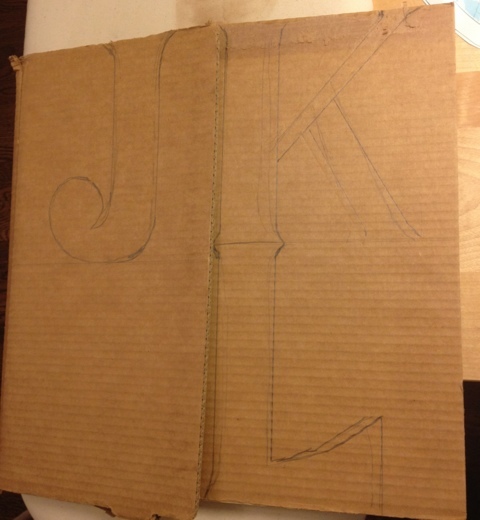 10) Insert the plain dowel in the bottom pocket and the one with the screw eyes in the top. Thread a ribbon through the screw eyes to hang the chart. 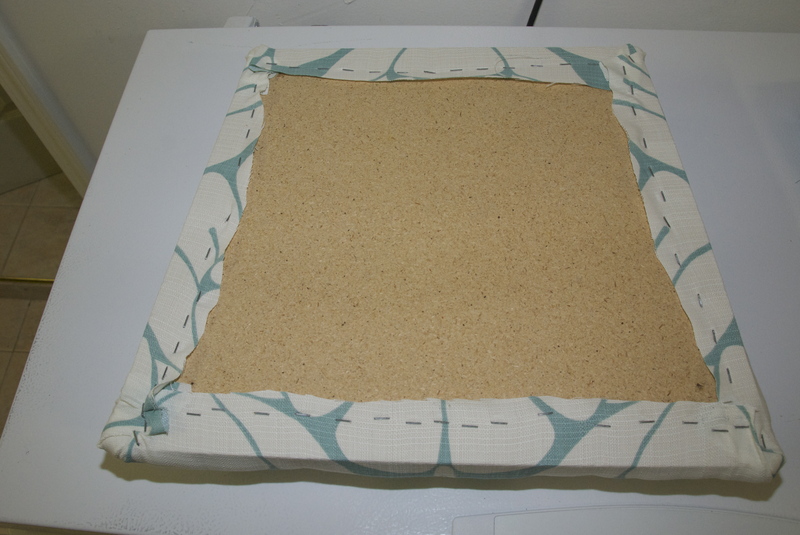 Finish: Sew 1.25″ flaps on the top and bottom to hold the dowels. 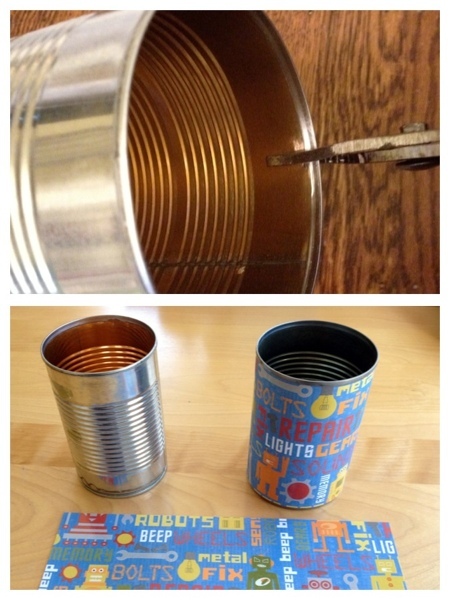 Insert screw eyes in the top piece and thread a ribbon through for hanging. Tada! The finished growth charts are hanging in the hallway outside our kids’ bath, opposite the newly organized laundry area. Hope I made that clear. I’d love to see pictures, if you make one of these yourself!